A recent study in Scientific Reports has concluded that lizards may have run on two feet (bipedally) as early as 110 million years ago. Although typical lizard locomotion is quadrupedal (on four feet), bipedalism is a behaviour exhibited by over 50 species of lizards. During bipedal locomotion, the forelimbs leave the ground and the trunk of the lizard is elevated; essentially the lizard looks like it is “standing up”. Only the lizard’s hind limbs power movement. It is not clear at what point in their evolution lizards developed the ability to run on their hind legs. 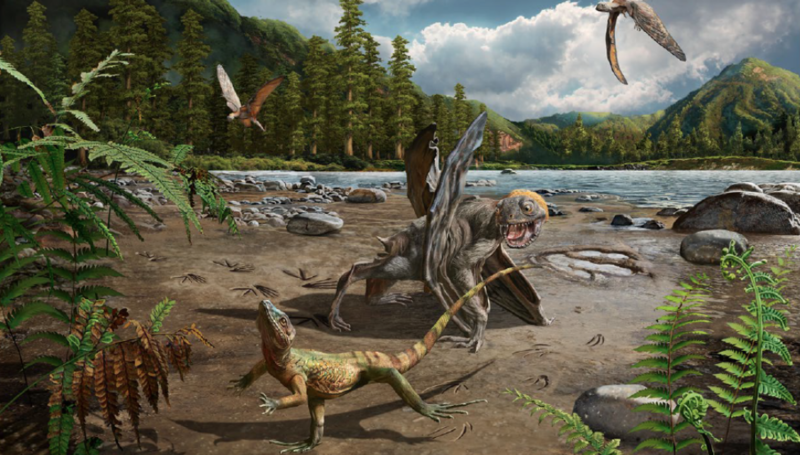 However in this study, Hang-Jae Lee and colleagues describe the first direct evidence of bipedal running in fossil lizards. Four series of lizard footprints (trackways) have been discovered in the Hasandong Formation (a Mesozoic geologic formation in South Korea) which has been dated back to the Aptian-early Albian period, 125 to 100 million years ago. These prints have been identified as Sauripes hadongensis, a group of fossilized lizard trackways which represent the oldest crown-group lizard trackways in the world. While it is not clear which specific lizard species made the tracks, the study’s authors hypothesize they may have come from an extinct family of Iguania (a lizard infraorder within the order Squamata (snakes and lizards) that contains the iguanas, chameleons, agamids, and New World lizards, such as anoles and phrynosomatids). The fossils were very well preserved, enabling a close study of lizard foot anatomy. The authors identified twenty-five foot (pes) tracks, showing typical lizard morphology, with curved digits increasing in length from the inside of the foot to the outside, and four shorter hand (manus) tracks with a longer third digit compared to the other four digits. The fossils revealed that the pes tracks were predominant, consistent with a two-legged than a four-legged gait pattern. The pes tracks also showed evidence of increasing stride length, and digitigrade footprints that suggest the lizards which made the tracks were running on their toes. The narrow width of the pes tracks indicates that the hind legs were straight and close, as befits bipedal posture. This, together with the predominant pes tracks indicates that the tracks were made by lizards running on their hind legs, suggesting that bipedality occurred early in lizard evolution. The study may be read here.